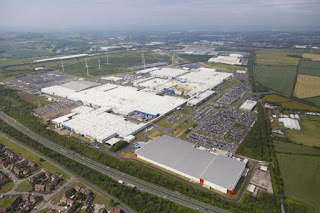 When UK Prime Minister Margaret Thatcher opened Nissan’s first European plant 30 years ago yesterday, the car maker had 470 staff and produced 5,000 vehicles at a rate of 12 an hour. Today, the plant has grown to become the largest in the UK, with more than half a million vehicles rolling off its line every year, now at a rate of 117 an hour. The plant employs almost 7,000 people, 117 of which have been there since 1986 (the plant in 1986 above). “I don’t think anyone realistically thought the plant would grow to one that is making half a million cars a year” plant manager Kevin Fitzpatrick told The Northern Echo. 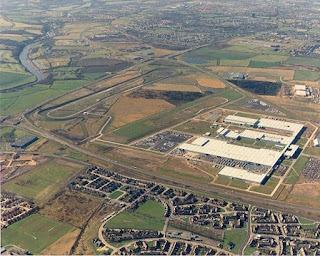 The Nissan plant is now an iconic feature of the Sunderland landscape, but some may be surprised the Japanese company chose a relatively unknown North-East town, as it was, for its first European venture. “Nissan wanted to come to the UK. There was competition between the North East, Wales and the Midlands,” he added. Nissan’s arrival in the North-East coincided with a troubled industrial time. Relationships between bosses and workers were at an all-time low. But the company were ready to change things. But Nissan paved the way for other car makers to come to Britain including BMW, Honda Motor Company, Toyota Motor Company and Volkswagen AG (through Bentley Motors). “We transferred the good stuff from Japan and we wanted to get away from the traditional way of running a factory with an approach based on teamwork, engagement and everyone having a role to play. While Nissan’s past is one of great success, its future (the plant today is pictured below) is more unclear. More than 60 per cent of people in Sunderland voted for Brexit, despite its biggest employer openly supporting Britain remaining in the EU. The company says it is “monitoring the situation” post the referendum, but if they were making their first European venture in 2016, would it be to Sunderland in a Brexit Britain? “It’s an impossible question to answer” said Fitzpatrick. “The key part is the available workforce. If Nissan didn’t come, Sunderland would not have had a manufacturing heritage for Nissan to latch on to,” said Fitzpatrick. “I don’t think you could have persuaded anyone else to come in with the scale of employment Nissan has created. A lot of industrial skills would have been lost quite quickly. If Nissan did leave the North-East, a city would lose its prime industry, leaving thousands unemployed, as was the case when it arrived three decades ago. Has it recreated the problem? “It’s a hypothetical question” said Fitzpatrick. “We’ve got no intention of sitting back and letting what we’ve built up fritter away. It is in our hands. You can get complacent and wither away or you can be competitive, challenging, ambitious and look after your own future,” he concluded.